Abbé Georges Lemaître (1894-1966) met for the first time Albert Einstein in October 1927, during the Fifth Solvay Congress of Physics in Brussels. These Congresses, as we know, played major roles in the history of Physics. At this 1927 Congress were present amongst others: Marie Curie, Bohr, Born, Dirac, de Broglie, Schrödinger, Heisenberg, … The invitation of Lemaître at this Congress was probably suggested to the organizers by Professor Théophile de Donder, of the “Université Libre de Bruxelles” who had written one of the first books, in French, about the General Theory of Relativity. De Donder knew the young Abbé, because he was in the jury who gave him a grant to go to Cambridge (UK) after Lemaître had won a competition, having submitted a manuscript entitled “The Physics of Einstein”. By the way, De Donder said, to recommend him to Eddington, that he “found M. Lemaître a very brilliant student, wonderfully quick and clear-sighted, and of great mathematical ability”. In 1926, Lemaître had just gotten his PhD at the MIT and, in 1927, he had also published his famous paper entitled, “A homogeneous universe of constant mass and increasing radius accounting for the radial velocity of extra-galactic nebulae” explaining what we call now the “Hubble law”. Starting from a solution of Einstein equations corresponding to an expanding universe Lemaître deduced rigorously and for the first time the fact that the speed of the far galaxies (called at this time nebulae) is proportional to their distance (the proportionality constant is called now the “Hubble constant”). This seminal paper, in which one can found the computation of the Hubble constant (two years before the publication of Hubble law! ), was published by the Belgian Journal: Les Annales de la Société Scientifique de Bruxelles. This Journal was in fact the Review of the Société Scientifique de Bruxelles, a society gathering Catholic scientists and which played a central role in the organization of the International Scientific Congresses of the Catholics at the end of the nineteen’s century. It happens that, thanks to one of his friend, Einstein had read Lemaître’s paper. Walking along the alleys of the “Parc Léopold” in Brussels, close to the building where the Congress took place, Einstein and Lemaître discussed the 1927 paper. Einstein had nothing to say to the young Abbé about the mathematical part of his paper, technically it was perfect, but he completely disagreed with him concerning its physical interpretation. Einstein said very crudely: “from the point of view of Physics this seems to me abominable”. What’s the reason of such brutal reaction? In fact Einstein did not admit at this time an expanding universe. Probably influenced by his implicit Spinozist philosophy, he did not accept the fact that the universe had a real history. One remembers that Einstein had shown his strong opposition to the papers of Alexander Friedmann, this Russian mathematician and meteorologist who discovered in 1922-1924 solutions of Einstein’s equations corresponding to expanding and contracting universes. According to Einstein, the universe as a whole has to remain forever immutable. Einstein’s first cosmological model, published in 1917, was indeed a spherical and perfectly static universe. It is worth noting that Georges Lemaître, at the time he wrote his paper on the recession of the nebulae, did not know Friedmann’s discoveries. In 1929 Lemaître told that it was Einstein himself who informed him about the existence of the “Friedmann (expanding and contracting) universes”. During the walk in the “Parc Léopold”, Einstein was also accompanied by Professor Auguste Piccard (who is the grand-father of Bertrand Piccard, the initiator and pilot of the solar airplane: Solar Impulse; you may not know that the cartoonist Hergé modeled his “Professor Calculus” in The Adventures of Tintin on Professor Piccard!). The reason was that the latter wanted to show to Einstein his laboratory located inside the Université Libre de Bruxelles (U.L.B.). Piccard was also a known physicist with a world-class reputation. He was interested in the study of Cosmic Rays, in the test of the Relativity Theory, and in 1931 he will measure the activity of the Cosmic Rays going himself in the stratosphere in a pressurized capsule took by a very large balloon. Piccard, proposed to Lemaître to make this visit with Einstein. Going to the Université Libre de Bruxelles’s campus, Lemaître continued his discussion. He spoke about the astronomical data (the galaxies indexed in the so-called Strömberg’s catalog) he used to derive the “Hubble constant”. Lemaître was puzzled by the fact that, at this time, Einstein was not really informed of such astronomical data. At the end of the year 1932 Lemaître went to the California Institute of Technology (the famous Caltech) at Pasadena near Los Angeles, because of an invitation of the Nobel Prizewinner Robert Millikan, who was deeply interested in the nature and properties of Cosmic Rays. In January 1933, Lemaître is still at the Caltech when Einstein arrived there coming from Los Angeles. The latter was highly interested in the recent Lemaître’s cosmological ideas in the context of his “Primeval Atom Hypothesis” dating back 1931. Einstein attended a seminar, on 11 January, given by the Abbé about Cosmic Rays at Mount Wilson Observatory near Pasadena, the famous place where Edwin Hubble worked. We know that Lemaître considered those radiations as a kind of “fossil radiation” which could tell us something about the first moments of the universe. After the seminar, Einstein would have to go to a seminar of Theoretical Physics. But, forgetting the latter, he preferred to continue to speak with Lemaître about cosmology! In fact, during these discussions, Einstein let him know that he did not like the “Primeval Atom Hypothesis” because, he said, “it suggests too much the (theological) idea of creation”. Curiously and maybe a little bit ironically Einstein had said after a talk of Lemaître in Pasadena where the latter explained his primeval atom cosmology: “This is the most beautiful and satisfactory explanation of creation to which I have ever listened”! Lemaître did never begin a real philosophical discussion with Einstein. But of course, thanks to his thomist training in Louvain, Lemaître identified perfectly the confusion made by his friend, and also a great number of cosmologists after him, between “creation” and “beginning”. According to Lemaître, the initial singularity was not “the creation” (in the theological sense) but only the “natural beginning” as he said many times. At this time, Einstein had accepted the idea of an expanding universe but he cannot accept an initial singularity, a beginning of the universe. He suggested to Lemaître to modify a little bit his cosmological model, which was isotropic and homogenous, accepting some anisotropy hoping that, due to that change, the universe would avoid the initial singularity. Rapidly the Abbé proved that this anisotropic universe (what we are calling today a Bianchi universe) would not avoid the singularity either. 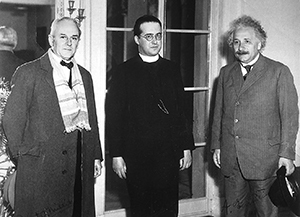 Some clues indicate that during their discussions at Pasadena, Lemaître took the opportunity to know a little bit about the assumptions being at the root of Einstein’s vision of the universe. For example, Lemaître was strongly in favor of a finite universe because he said that an infinite one could not be really commensurable to the human thought. He tried thus to understand if Einstein believed really in the possibility of an infinite cosmos. On 17 January Lemaître gave a seminar on the role played by the famous “cosmological constant” (which is related, in the Einstein equations, to a kind of repulsive gravitational force, responsible for the present acceleration of the universe) and Einstein took part at the discussion together with Paul Epstein and Richard Tolman, both professors of Physics at the Caltech. We will come back to the problem of the cosmological constant, because Einstein, who had however introduced this constant in 1917 to get his spherical and static universe, disagreed with the Abbé about the physical importance of such constant. There is an anecdote dating back to this time. Many journalists tried to get some information coming from Einstein-Lemaître discussions. The cosmological constant was written in Einstein’s equations as a lower-case Greek letter “lambda”, a “little lambda”, and some journalists joke about that referring to the “little lamb”! and this provided great amusement for the always jovial Canon. In February 1933, Lemaître went back to Louvain to begin a new academic semester. The year 1933, the two physicists had the pleasure to meet once again. Einstein, who cannot go back to Germany due to the Nazis, was welcome and protected in Belgium, by the Belgian Royal Family: King Albert and Queen Elisabeth who had become close friends. He received a villa at De Haan (Le Coq-sur-Mer) a little seaside town on the Belgian coast and Lemaître visited him there once. During his stay in Belgium, Einstein gave three seminars about Spinor Theory at the “Fondation Universitaire” at the center of Brussels. Théophile De Donder, organized one of these seminars. It is worth to note here that De Donder influenced Lemaître deeply at the beginning of his career with regard to his understanding of Relativity Theory. His first scientific paper is in fact dedicated to a version of the calculus of variations built by De Donder. Lemaître was invited by Einstein to speak also on Spinor Theory. Some journalists asked Einstein if somebody in the audience had understood something during his talks? And laughing, Einstein answered: “De Donder maybe, Abbé Lemaître certainly!” Spinor Theory is a very important theory used to describe the relativistic electron. Sir Arthur Eddington who was one of the professors of Lemaître in Cambridge (U.K.) introduced him into the algebraic formalism of such a theory. Lemaître made also contributions to this theory, anticipating some works of the famous Italian physicist Ettore Majorana, and still at the end of his life Lemaître paid attention to this theory, taught it in his Louvain lectures and discussed about this field with the famous French mathematician Elie Cartan. Lemaître went back to the USA in January 1935, because he was invited by the School of Mathematics of the Institute for Advanced Study, in Princeton, where Einstein had been appointed professor. During his stay, Lemaître organized a meeting of some professors of the Institute concerning the last ideas of Einstein concerning his theory of unitary field. But in fact Lemaître realized that those Einstein’s ideas were not well accepted, because many considered that he was going into a dead-end. Lemaître was admiring the works of Einstein but he was perfectly aware of the limits of some of his last theoretical attempts. He kindly reproached him for example to have the tendency, in his theory of a unitary field, to rule out the concepts that do not fit his own esthetical ideal. This is very important because this reveals something about the philosophy of Lemaître. The latter considered that a scientist has to follow always the narrow way passing at the same distance of two stumbling blocks: “the myopic positivism that cannot go far beyond the experience and the dreamy idealism that loose any contact with it”. Lemaître realized that some works of his friend, trying to generalize his theory of gravitation, were evolving towards this latter stumbling block. 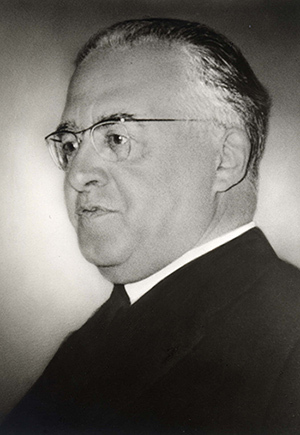 Lemaître leave the US in June 1935. In fact it was the last time he met Einstein. In 1949, P.A. Schilpp proposed to Canon Lemaître to write a chapter in a book Albert Einstein Philosopher and Scientist edited to celebrate Einstein’s 70th birthday. In Pasadena and in Princeton a great part of the Einstein-Lemaître discussions had been dedicated to the problem of the cosmological constant. Einstein wanted to suppress it and Lemaître considered that it was a very important, yet still maybe not well formulated, term of the relativistic cosmology formalism. In a letter of 30 July 1947 to Einstein, Canon said him that he considered that the introduction of the cosmological constant was one of his greatest contributions to science! Therefore Lemaître decided to send a text concerning this constant, as a way to continue the Pasadena discussions. Today, it is interesting to realize that Lemaître had in fact a very deep and right intuition. In fact the recent astronomical data show that the cosmological constant cannot be eliminated because it is related to the observed acceleration of the universe and to the famous “dark energy”. In order to understand clearly the meaning of this constant, we probably need some quantum field theory and Lemaître thought the same thing. Lemaître did never achieved to convince Einstein of his interpretation of the cosmological constant. And the Canon even confessed that he had not always understood the arguments used by the father of the relativity Theory to get rid of the famous constant. Until the end of his life, Einstein considered that it would be “abominable” (as he said in his answer to the 1947 letter quoted above) to suppose that gravitation is made of two logically independent term: one which is attractive (as in the classical case) and the other one being repulsive and described by the cosmological constant. We can emphasize here a difference between both physicists. In theoretical physics, Lemaître was not guided first by esthetical or logical considerations. He often refused to go too far in mathematical speculations and he tried to remain near observations accepting incomplete or approximate formalisms. Einstein’s position concerning the cosmological constant is a very important one. In 1945, after having attended a conference of Lemaître in Fribourg (Switzerland) Einstein’s close friend, Michele Besso, discussed with him of the fact that the Canon refused to set the constant to zero. We can conclude saying that Lemaître was certainly one of the scientists who understood deeply the General Theory of Relativity. Despite of their theoretical and philosophical discrepancies, the discussion and the letters reveal that Einstein appreciated Lemaître’s cosmological contributions. In front of Einstein, Canon Lemaître has never changed at all the positions he considered as fundamental ones. Quite the contrary, he tried to convince the famous father of the Relativity Theory of the relevance of his ideas about the expansion of the universe, the initial singularity and the cosmological constant. We know that Einstein changed his position accepting the idea of an expanding universe. The reason is not directly related to a conversation with Georges Lemaître, but we can suppose that Lemaître’s 1927 paper could have played some role in this theoretical conversion. Lemaître has a great admiration for Albert Einstein, the scientist and the thinker, who was considered by him as one of “the noblest minds of humanity”.